Purpose Statement: To share with the ministers in building and supporting our church’s spiritual life. Goal: To free the pastoral staff thus enabling them to focus on prayer and the ministry of the Word while promoting unity within the church and facilitating the spreading of the gospel. Responsibilities: Ongoing duties include assisting with communion services, baptisms, delivering flowers and sharing communion with the sick and shut-in, expressing concern by calling members to encourage them and assisting the Pastor in any way possible. Deacons are called to be dedicated caregivers who use their spiritual gifts in a shared ministry of concern for the total well-being of God’s people. Deacons are to be Christ-like, welcoming, nurturing, reconciling, and sensitive to the presence of God’s spirit in their lives and in the lives of others. Deacons have an obligation to witness for Jesus Christ as Savior and Lord within and beyond the Body of Christ, which is the Church. Deacons have the privilege to wear the “badge of honor” in that they are one of the two named church officers that are mentioned in the bible. Deacons in the New Testament served the Lord by conducting the caring ministry of the church, doing the benevolence work, visiting the sick and being alert to the spiritual needs of the congregation. We at New Bethel are proud to have Deacons that hold such a standard as God requires. The word succourer is interesting in that it means someone who gives help in times of need, distress or difficulty. The servant that Paul referred to above is the elect woman that we call “Deaconess” in our church. Purpose Statement: To care for and assist the needs of the overall congregation. 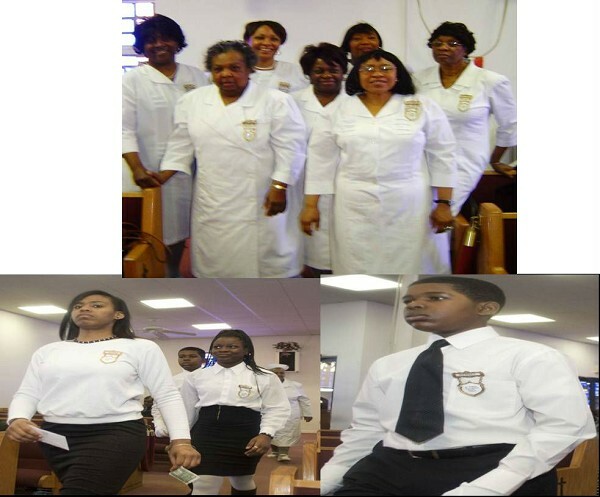 Mission Statement: To meet the needs of the New Bethel Missionary Baptist Church, under the spiritual guidance of its Pastor and the Deacons by promoting the spiritual growth in the church. 2. Oversee the dressing of the Baptismal Candidates for baptism; keep an account of the use and return of laundry of the Baptism attire. Women who are devoted to God should make themselves attractive by the good things they do. "Make a joyful noise unto the Lord, all the lands! Serve the Lord with gladness! New Bethel Missionary Baptist Church’s Music Ministry is strategically designed to set the tone for the worship experience. We believe that music stirs the heart and mind of both the performer and hearer. We gather to serve the Lord wholeheartedly ministering divine praise through words, pitch and rhythm. Purpose: Our purpose is to be a safe haven for individuals to freely praise, worship and celebrate God and His mighty works through the ministry of dance. Mission: Our mission is to encourage the people of God and cultivate an atmosphere of salvation, healing, deliverance, peace, joy and healing. Vision: Through participation in this ministry, members will be devoted to God by prayer & fasting, fellowship, and bible study and community service/evangelism. Members will understand that they were fearfully and wonderfully made by God, created to do good works and praise Him. Members will not only master the art of praise dance but, be committed to allowing God to use them to minister to all people. than to dwell in the tents of wickedness."